With my time in Croatia quickly coming to an end, I was determined to squeeze in every last excursion possible. 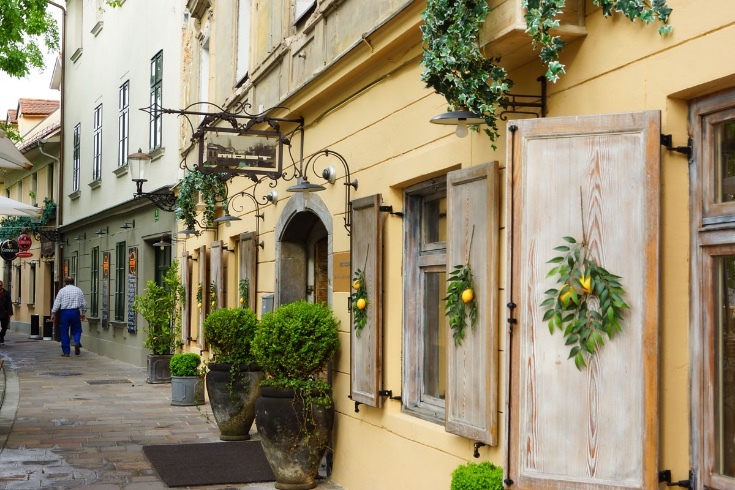 While researching destinations online, I stumbled on Ljubljana, the capital of Slovenia. Not realizing it was just across the border, the beautiful photos captured my attention. 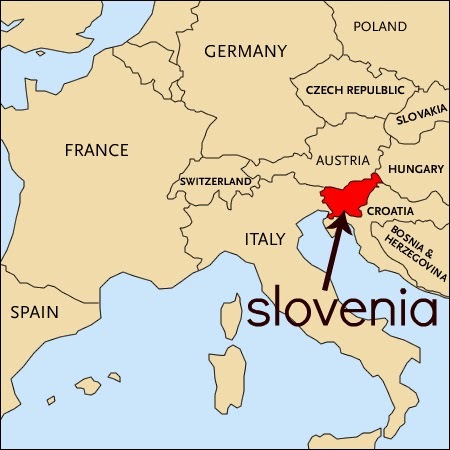 My project was to write about Croatia, not Slovenia. But since both were part of the former Yugoslavia, share a border and speak practically the same language I justified the trip. 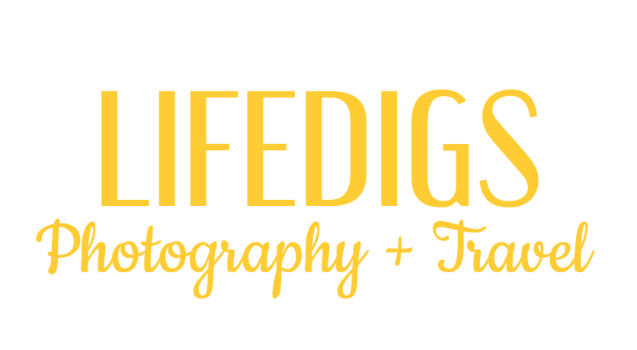 With a limited travel budget, I had become quite skilled at finding good lodging online. I always started with general travel sites of an area. Then once I zeroed in on a location that I liked, I dug deeper. This time it brought me to http://www.old-town.si. The website showcased 3 rooms for rent that were in the heart of Old Town, recently renovated and very reasonably priced. Not only that, it provided detailed information on the surrounding area and explicit instructions on how to get there by train from Zagreb. So, on a Sunday I made reservations for arrival the very next day! Last minute travel plans are always the most exciting! From my apartment, I walked to the train station in Bjelovar for travel to Zagreb. From there, I took the nonstop train to Ljubjlana. (Travel by train is and will always be my favorite mode of transporation.) The train was coming from Belgrade, Serbia and was already 10 minutes late. Several passengers were standing on the platform looking around and checking their watches. I stopped a passing conductor and asked him what the problem was. He looked up at one of the monitors and said that our train would be seven hours late. My mouth dropped open. Really?? Seven hours?? Trains running late was fairly normal but seven hours late was not. All sorts of ideas flew through my head. To pass the time, I could visit my friend Mark who lived close by or I could do some sight seeing in Zagreb. I went into the terminal and asked someone at the information desk if she knew exactly when the train was going to be there and she said it should arrive in the next 5 minutes. Glad I double checked!! What was that conductor thinking?? Less than an hour into the trip we reached the Slovenian border. Both Croatian and Slovenian border guards boarded the train and checked our passports. After all this time, I have yet to understand why border guards from the country you are leaving need to check your passport. Why do they care who is leaving? The landscape changed almost instantly as we entered Slovenia. The green landscape got greener and the hills got hillier. We followed the River Sava through the mountains into what can be best described as a scene from a Hans Christian Andersen fable. It was fantastic! Adding to the fairy tale landscape, I noticed that all of the homes had very steep roofs. Later it was explained to me that this is to keep the weight of the snow off of the homes. Makes sense. When the train pulled into Ljubljana, all I could think about was getting something to eat. In my haste to get off the train, I left my jacket behind. I would later regret that mistake. Walking with purpose, I headed in the direction of Old Town. According to my instructions I was to turn right at the Dragon Bridge. 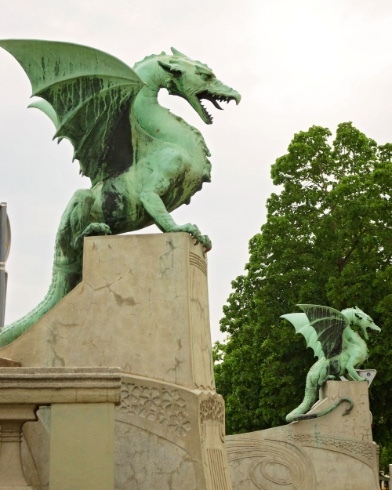 Sure enough, I was greeted by 2 large dragon statues at the Ljubljanica River . One of the legends of the dragons is from Greek mythology where Jason and his Argonauts killed a dragon in Ljubljana. 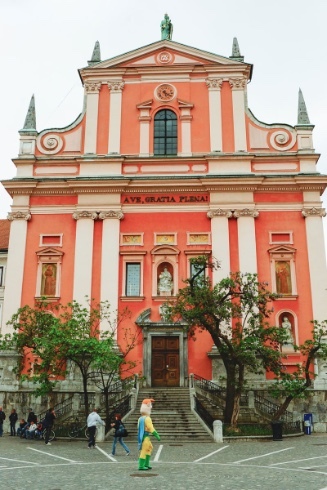 The other legend involves St. George, the patron saint of the Ljubljana Castle Chapel built in the 15th century. He is commonly depicted killing a dragon in paintings. 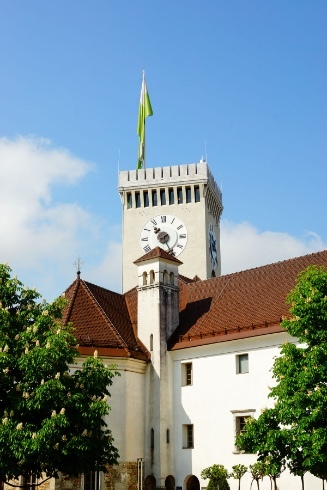 Others believe the dragon was just added as decoration to the Ljubjlana coat of arms. Just a few steps down from the Dragon Bridge I found my apartment...right on the river! It was a fabulous location and I couldn't believe how lucky I was. The interior was completely renovated and it was like staying in a brand new and modern hotel. I spent exactly 60 seconds freshening up and hit the pavement to find a restaurant. The first outdoor restaurant I came to looked nice, so I grabbed a seat and soaked in the view of the Ljubljanica River which traveled through Old Town. I ordered a smoked salmon salad and the waiter brought me fresh rolls. I got out my camera and started shooting photos from my seat. Out of the corner of my eye, I noticed the napkin of my bread basket moving. 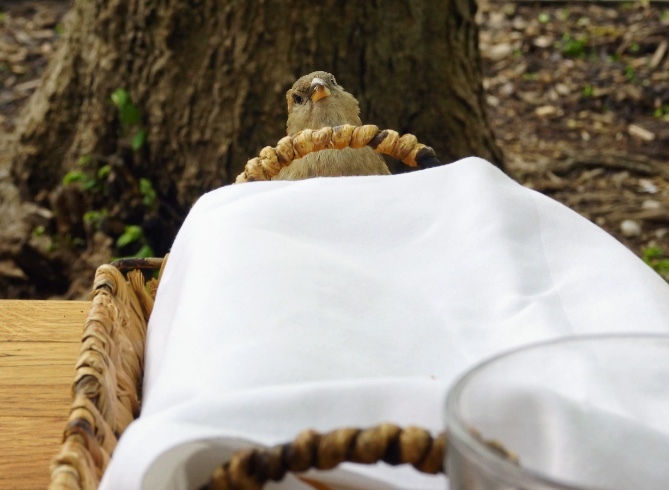 When I looked down, a sparrow popped out from under the napkin, clearly helping himself to my dinner rolls. He looked at me and then stuck his head back under the napkin for some more bread. He continued this popping in and out for quite some time which gave me an opportunity to snap some photos of him. If it hadn't been so hilarious, I would have been annoyed because it was really good bread and I didn't want to share. A little while later, I was holding a small piece of bread between my fingers when a very aggressive sparrow swooped down and snatched it out of my hand. The waiter walked by and said, "Don't feed the birds!" 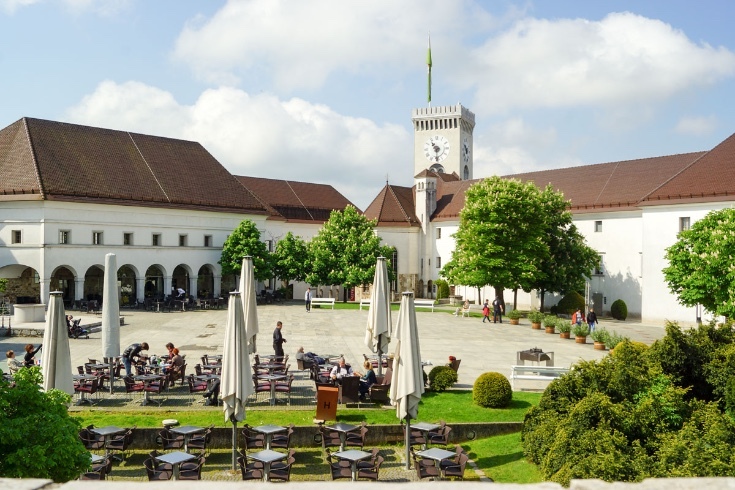 With only 48 hours to spend in Ljubjlana, I make this quick itinerary of things to see and do. The river boat cruise, down the Ljubljanica River, was a bargain at 10 euros. It was a relaxing way to travel deeper into the city and give my feet a break. As the only American on the boat, I soon became very interested in the 4 different conversations going on around me in 4 different languages: Italian, Spanish, German and Slovenian. Europeans are typically very animated and affectionate in the way they communicate with each other. It was fascinating to witness the varying degrees of this behavior. Guess which group was the loudest and most animated? Yep, the Italians. From the boat, I looked up and saw the imposing castle up on the hill and knew that was my next stop. 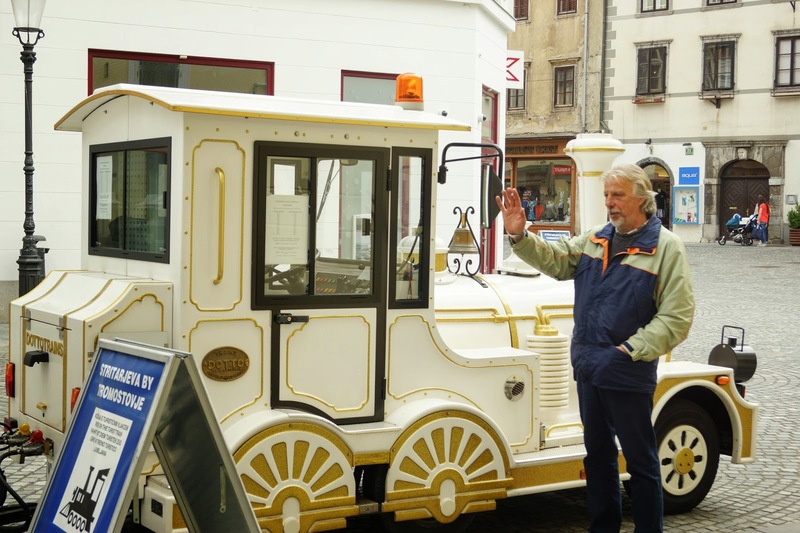 The tourist train to the Ljubjlana Castle originated at the city centre and departed every hour on the hour. It was similar to the trams that are used to shuttle people in large parking lots. The price of the roundtrip ticket was only 4 Euros and it sure beat the walk straight up into the hills. Once at the top, there was a wonderful panoramic view of the city. And that was just the beginning. Look to the left, and you are staring at a 15th century castle! 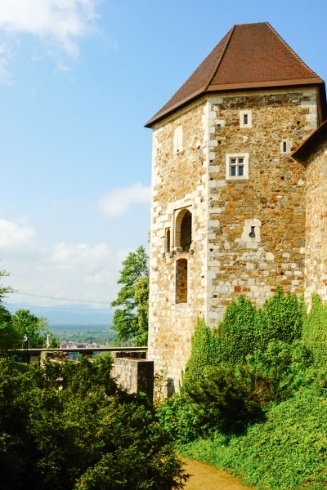 Originally built by the Habsburgs (and it seems like everything is) for protection from Turkish invasions, the castle had served many purposes over the centuries. It's been a hospital, and arsenal, a jail and a refuge for ostracized Ljubljana citizens. After touring the inside of the castle, I sat in the courtyard to enjoy a cup of coffee. Feeling very relaxed, I thought about how lucky Europeans are to be surrounded by such amazing history, beauty and majesty. The other patrons seated around me (they each had a dog with them, by the way) appeared to be mostly locals instead of tourists. Can you imagine telling your friend to meet you at the castle for coffee or telling your boss you are taking your coffee break up at the castle? Ljubljana's Central Market stretched between the Dragon Bridge and the Triple Bridge in the city center. 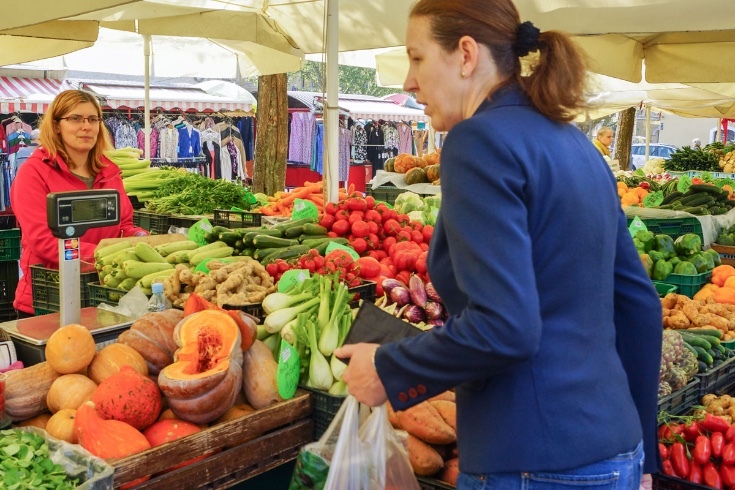 It included an outdoor market in Vodnikov Square and a covered market along the river. It was an explosion of color and smells from the beautiful produce and flowers of local farmers to the fresh bread baked in wood fired ovens. 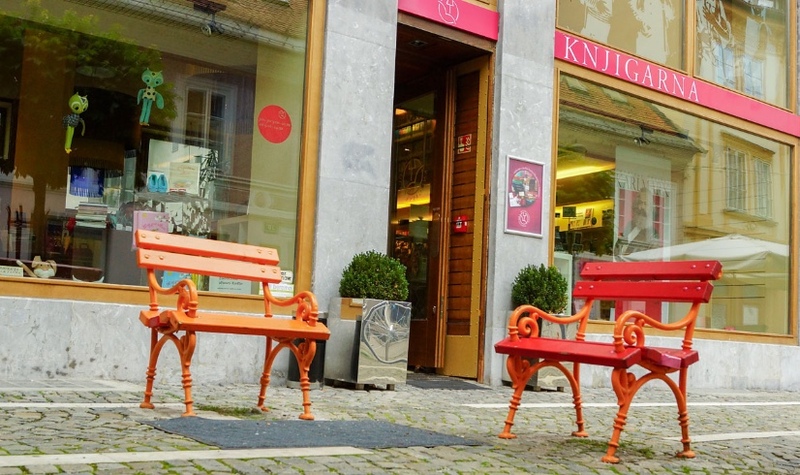 You can find smoked meats, fresh cheese, even clothing and shoes. 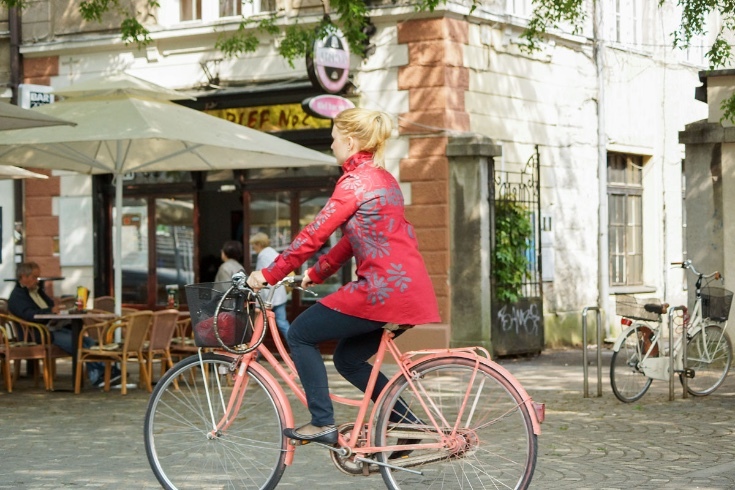 The citizens of Ljubljana showed up to do a little shopping and a lot of mingling. I wanted to buy something from every booth but I settled on a handful of tangerines. I walked over to the Triple Bridge and sat down at the base of the statue of the Slovenian poet, France Prešeren. As this was the major thoroughfare in Old Town, it was a great opportunity to people watch and eat my tangerines. The pedestrians seemed to all be tourists and the hundreds of bicyclists seemed to all be locals. Street performers competed for your attention and your tips. I particularly enjoyed a group of men who were singing traditional folk songs. Even though I couldn't recognize their language, I thought they were fantastic! I love how the little girls dances faster and faster to the music! My last item on the checklist was Tivoli Park. 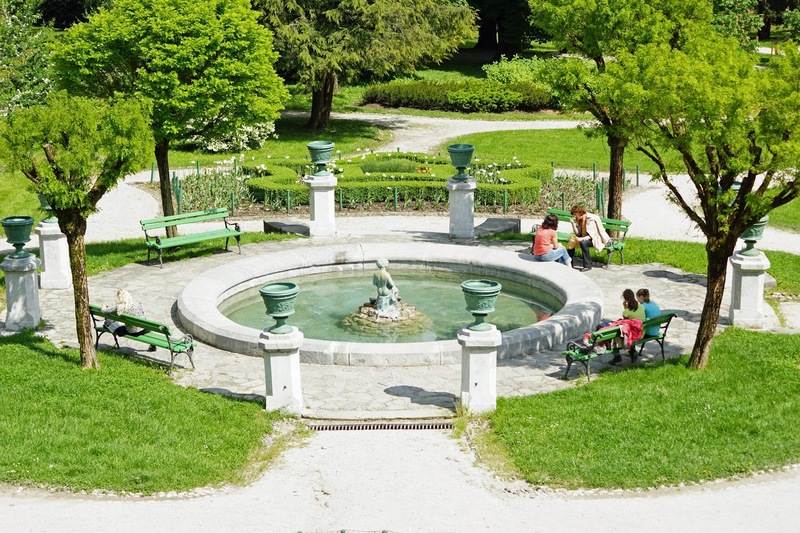 Designed in 1813, it was s a 10 minute walk from the city center and covered over 1,200 acres. Here you will find locals sitting under trees reading books and picnicking, groups of college kids playing soccer, bike riders zipping through, and people relaxing on park benches. It was beautiful and peaceful and a perfect end to my trip. The people in Ljubjlana were extremely friendly, hip and funky. As a matter of fact, the town itself was pretty funky. Many shops were brightly colored with unique handmade items crafted by the designers themselves at a work table in the middle of the store. Even though this is a capital city, the attitude everywhere seemed to be very relaxed with a small town feel. Sadly, it was time to take the train back home, my Croatian home, that is. 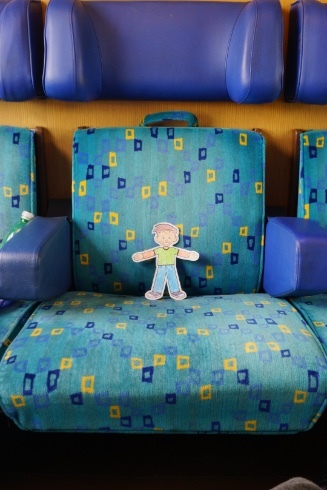 This time I shared a compartment with a Serbian man named Zravko. We had a great conversation and he explained to me he was half Croatian, half Serbian, worked in Zurich and lived in Belgrade. Now that's quite a commute! I showed him the video I took of the men singing in Ljubljana and he exclaimed, "Gypsy music!" I told him how much I loved it and I thought it sounded like Croatian or Serbian folk music. He explained that they sound very similar and said he had a present for me. He reached into his suitcase and pulled out a boxed set of gypsy music. Each CD was music from a different country, Hungary, Croatian, Romania, etc. I told him I couldn't accept such a nice gift and he waved me off. He said "I collect gypsy music and I have thousands of cd's." I don't know why I wanted so badly to have a compartment to myself. Sharing stories with locals is a fantastic way to learn about their culture and just a lovely way to spend an afternoon.